The past couple of weeks have been extremely exciting. We began shipping our beta units to our trusted PUSH Labs members and we can’t wait to get their feedback. I should also mention that before the betas were shipped, the units underwent stringent testing, and I was lucky enough to do a lot of the testing myself. Although in the past I've had the opportunity to use expensive, technical devices to measure force, velocity and power outputs, those occurrences were few and far between and limited to lab-based settings. With that said, it was my first real stab at using velocity thresholds during training - and what a fun experience it has been! This brings me to last week. I put velocity to the test - exercise of choice? Bench press. My goal was to stay above 0.35m/s but below 0.75m/s (more on why a little later). Here’s snapshot of what one of my sets looked like while using velocity as a biometric feedback tool. The first thing you’ll notice is that it took me 12 reps to fall below 0.35m/s. In practical settings, coaches like Bryan Mann from Missouri, will wait til two consecutive reps fall below a certain threshold before terminating a set (which is why I did one more rep after I fell below my velocity threshold). This ensures that fatigue has set in and the response is no longer present. 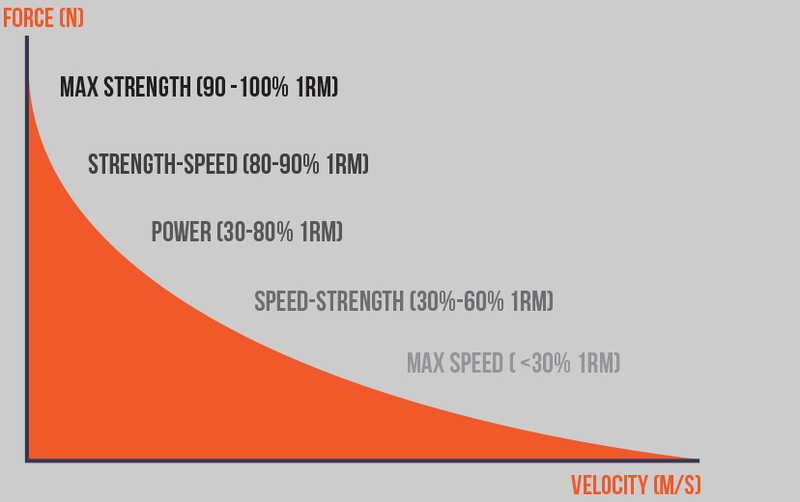 Before I explain why Velocity Based Training (VBT) is ‘the way of the future', I’ll quickly outline how many coaches currently use Percentage Based Training (PBT) with their athletes and why this may not be the most practical approach. Remember the Force-Velocity (F-V) curve from an earlier post? If not, check out figure 1. Let’s use max strength as an example. If you are prescribing a training load for an athlete and you want him to work at 90% of 1RM, the first thing you’ll need to know is what his 1RM is. PBT is always based off of an athlete’s 1RM. From week 1 to week 4, an athlete’s 1RM will change (hopefully it will increase) but unless you test it again, you won’t know that. Translation, you may not be providing a big enough stimulus for that athlete. Again, for the most accurate use of percentage based training, 1RM testing needs to occur frequently. Scheduling these testing sessions can be an inefficient use of time. Athletes may not be capable of reaching their ‘true’ 1RM because psychologically, they may not be able to push themselves with heavier loads. If you don’t regularly lift heavy loads, there may be too much stress placed on the musculoskeletal system, predisposing an athlete to an injury. Randell et al examined the effects of instantaneous velocity feedback vs. no feedback in rugby players during jump squat training. Check out the results in figure 2. As you can see, instant feedback can be a big motivator! When athletes are required to move in a specific range, that range will determine the load they should use for a particular set. Once you dip under a certain threshold (my bench press example from earlier), the set is terminated. Look at Figure 3...the updated F-V curve. Compared to PBT, using velocities can be an easy way to train the appropriate strength quality. Athletes are in nature, competitive. When you can show an athlete a number, they will try to beat that number. With Velocity Based Training, athletes can compete against their own scores, and the scores of their teammates. When an athlete needs to increase the load to stay in the prescribed velocity range, this means one thing - he will now produce more force and ultimately, increase peak power output. Olympic lifts require speed, how much? Take a look at Figure 4 below. Looking at these numbers, you’ll have a better idea of what exercise to use for the training quality you’re trying to develop. Although coaches are using standards and ranges that were established years ago by the likes of Verkhoshansky and Siff (pioneers of our field), more research is needed. Why? What about hypertrophy training? Some athletes need to increase size in order to compete at the highest levels but what ranges are best to elicit this adaptation? What about novice lifters versus more experienced lifters? Surely technique plays a role in velocity outputs, but in what way? All of these questions, and more, warrant further investigation. Nevertheless, biometric feedback can be a valuable tool for the strength & conditioning coach. Jennings et al, 2005. The Reliability of the FitroDyne as a Measure of Muscle Power. Journal of Strength and Conditioning Research. Mann et al 2012. NFL-225 Test To Predict 1RM Bench Press in NCAA Division 1 Football Players. Journal of Strength and Conditioning Research. Mann, 2014. Velocity Based Training. NSCA Coaches Conference. Randell et al, 2011. Effect of Instantaneous Performance Feedback During 6 Weeks of Velocity-Based Resistance Training on Sport-Specific Performance Tests. Older PostPUSH Kicking-Off 2014 in Indy!